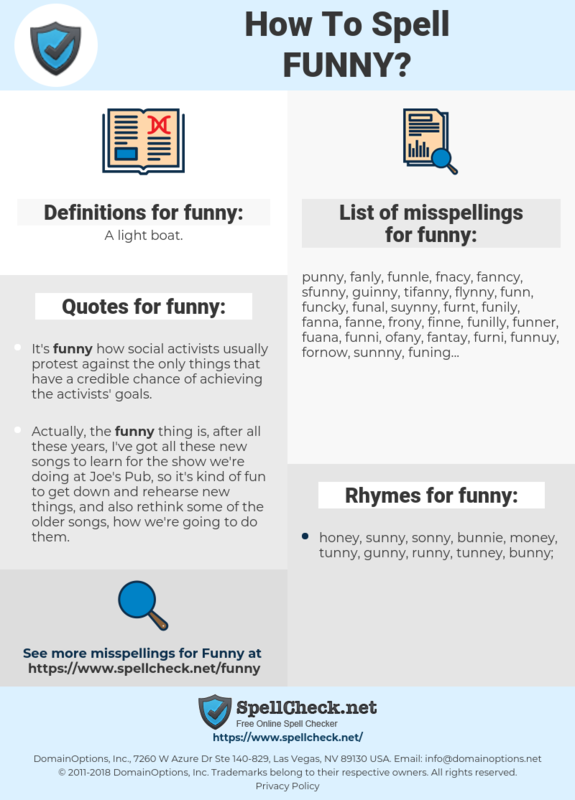 What are the misspellings for funny? 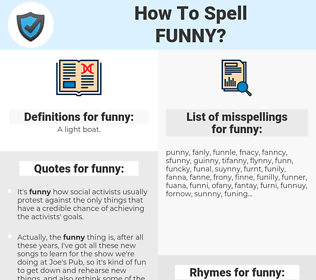 What are the common mistypes for funny? What is the definition of funny? What are the quotes for funny? What are the rhymes for funny? What are the translations for funny? What are the common typos for funny? This graph shows how "funny" have occurred between 1800 and 2008 in a corpus of English books. leuk, vreemd, gek, grappig, raar, geestig, onverwacht, ongewoon, vermakelijk, lollig, plezant. curieux, singulier, risible, divertissant, bizarre, hilarant, cocasse, drôles, marrant, comique, rigolo, humoristique, désopilant, tordant, bidonnant, poilant. seltsam, komisch, kurios, ulkig, originell, gediegen, putzig, lustig, witzig, drollig, possierlich, amüsant, humorvoll, spaßhaft, juxig, Komik. ファニー, おもすれー, 剽軽, おもしれー, おもしれえ, ひょうきん, おもすれえ, 面白い. estranho, interessante, engraçado, esquisito, cómico, hilário, graciosa. забавный, весёлый, комичный, потешный, курьёзный, прикольный, занятный, занимательный. raro, divertido, curioso, gracioso, peculiar, sospechoso, cómico, chistoso.